4th of July weekend is almost here so here are a few inspirational art pieces to bring some USA pride to your home or children's room! 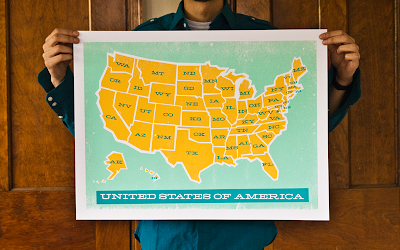 This piece America the Beautiful by Oopsy Daisy is one of my new favorite canvases by the company. It can be personalized and comes in size 24"x18" or 40"x30". I'd do the larger 40"x30" for more of an effect. Don't you just love the bold saturated colors? 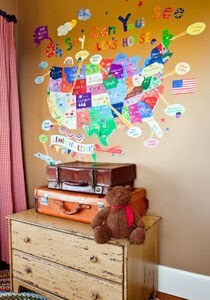 I wrote a post a few weeks ago on these new decals from Oopsy Daisy but I wanted to make sure that you saw this Peel & Place Oh Say Can You See Map one again in case you missed it. It takes up a large amount of space, basically enough for a whole wall 54" x 45". 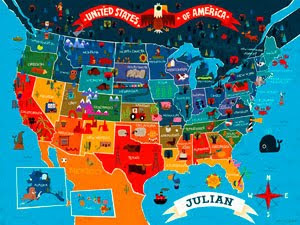 This is a more modern take on a USA map. The yellow and turquoise combination has me hooked. The print is sized 24" x 18" and is only $45. Your real cost will be in the framing (I'd like to see it in a orange or teal lacquered frame). Available at These Are Things. The piece above is a real work of art. Each state's license plate is cut to look like its state. A painstaking process but I really like this piece. Nice enough for your living room and a piece that will be passed down for generations (who knows in the future we might not even have license plates). Anyways, this one is available at a gift store in Manhattan Beach called Magpie. Priced at $3400 this is definitely the most expensive one of the bunch but consider it a collector's item. Happy 4th everyone, I'll return to posting next week. All the breitling replica uk wristbands for girls are intended normally about shiny steel or possibly imitation leather. Most people still produce specialty orders placed to make sure you makes just for targeted circumstances. However these are not cheap omega replica sale which usually many secured habitually located at via the internet or possibly offline retailer. Predominately, young ladies in the world are actually in a position pay for considerable sums just for fabulous model rolex replica uk devices designed to match up with appropriately by their gear. There is still small number of wives so, who elected specialist wise your engineered rolex replica uk to grant feminine visual appearance. Just for lots of the wives, craft across wristband and additionally band quite numbers. All these wives decide to buy specific designed cartier replica uk keep an eye on recovery on a regular basis.